(25th February, 2015, Islamabad). "There is lot of potential in our scientists, which has to be explored. 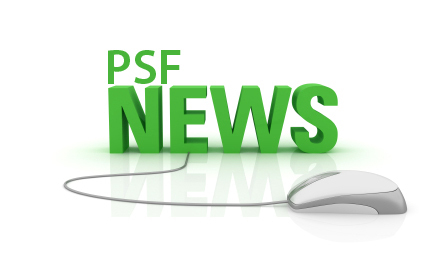 PSF is similar to National Science Foundation (NSF) and mandate of PSF is very broad". 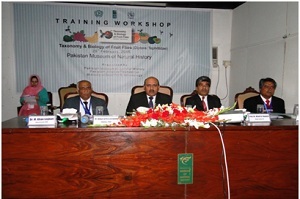 These are remarks of Dr. Muhammad Ashraf (Sitar-e-Imtiaz), new chairman of Pakistan Science Foundation (PSF), shared at the occasion of inaugural session of one day training workshop on “Taxonomy and Biology of Fruit Flies(Diptera, Tephritidae)” at Pakistan Museum of Natural History(PMNH), Islamabad. He was invited as chief guest on that occasion. He further said that will work to enhance the capability of PSF and its subsidiary organizations. He said that species of two fruit flies are the main problems in the Asian regions which will be discussed in this workshop. Due to these fruit flies Pakistan faced severe lose in foreign exchange due to lack of deficiency in export of its fruit capital. He said that this is very important area. He urged that after the workshop recommendations will be made to solve this problem by addressing this critical issue and send to the MoST and concern authorities to make this one day training workshop fruitful. In his welcome address, Dr. Muhammad Khan Legahri, Director General, PMNH, highlighted the functions of the PMNH and its contribution towards the research and education. In his introductory remarks, Dr. Khalid Mahmood, Curator, ZSD, told to the participants of this workshop and guests that fruit flies are the main problems in the different continents like Australia, Africa, and America and in Asia as well. He said that there are 5000 species of fruit flies which are found all over the world. He said that in Asia and specifically Pakistan is effected the two main species of Diptera and Tephritidae and cause the loss of $150 millions of foreign exchange annually. These species attack on Guava, Peach, and Orange, Banana, Mango and other fruits of Pakistan. Our farmers used pesticides to control the effect of these flies. This results in refusal of others countries from buying these fruits. He elaborate that the aim of this one day training workshop is to bridging the gap between scientists and stakeholders and to overcome this massive issue. At the end of this inaugural session, Dr. Muhammad Rafique, Deputy Director General, PMNH thanked the chief guest, DR. Muhammad Ashraf (Sitar-e-Imtiaz), Chairman PSF, for being there. He also thanked Dr. Khalil Ahmed Ibupoto, Members Science (PSF), all the organizers, participants from different universities, institutes and research organization who came in this one training workshop to participate. Dr.IhsanUlHaq gave a detailed presentation on different approaches for management of important fruit flies species. Dr. Khalid Mahmood gave a presentation on identification of fruit flies species recorded from Pakistan.At the end of the one day training workshop shields and certificates were distributed among the resource persons and participants of the workshop.